They were all buried today. ISRAEL HELD AN emotional funeral today for four Jews killed by an Islamist gunman in Paris, with thousands turning out to mourn the victims of an attack that shook the Jewish community. 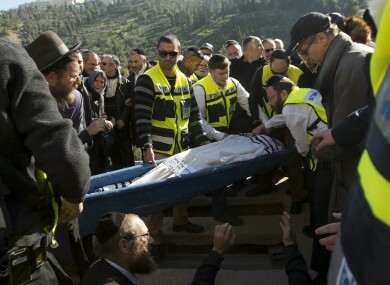 Shock and sorrow was palpable in the crowd as family members and top Israeli officials stood to pay tribute to the four men who were shot dead on Friday when an Islamic extremist stormed a kosher supermarket. The four were among 17 people gunned down in Paris during three days of bloodshed that began with a grisly attack on the satirical weekly Charlie Hebdo, in violence that convulsed France and sent shock waves through its Jewish community, the third-largest in the world. The bodies of the four Jews were flown to Israel early today and laid out in shrouds in front of an Israeli national flag for the funeral. Afterwards they were buried in a more private ceremony at the Givat Shaul cemetery. In the days before his death, Cohen joined millions of other Facebook users in posting “Je suis Charlie” (I am Charlie) on his page, in homage to the 12 people killed in Wednesday’s attack by jihadists on satirical weekly Charlie Hebdo. Two days after that strike, Cohen was among those killed in the assault on the kosher supermarket, where he had worked for about a year. According to the daily Le Parisien, Cohen had taken a gap year to earn money to finance his studies. Born in October 1994, Cohen lived in the Paris suburb of Sarcelles — known locally as “Little Jerusalem” — which was rocked by anti-Semitic violence last July. A fan of rap and a basketball player, Cohen was the grandson of Jewish Tunisian singer Doukha, who died in December. His Algerian father and his Tunisian mother settled in Sarcelles in the 1960s. A Tunisian student pursuing his education in Paris, Hattab was sent to France by his parents on the belief that life for a Jew would be safer here than in Tunis. Instead, Hattab was killed while trying to wrest control of one of the hostage-taker’s weapons during the siege. One of seven children born to the rabbi of the Great Synagogue in Tunis and headmaster of the city’s Jewish school, Hattab lived with his aunt in Paris, where he arrived less than a year ago. His family is no stranger to loss: in 1985 a Tunisian soldier opened fire at the Ghriba synagogue in Djerba killing five people, including the sister of Hattab’s mother, who was 17. Born in Tunis, Saada was a retired senior manager, and a father of two, both of whom live in Israel. Saada had planned on visiting Venice this week to celebrate his wife’s 60th birthday. “He was an extremely upright man, who led his life for the happiness of his family, who never made a fuss. An exemplary husband and dad,” one of his friends said. Braham was an advertising manager at a computer consultancy. A practising Jew who attended the Cachin synagogue south of Paris, his children attended a Jewish school in another southern Parisian suburb, Montrouge, where Coulibaly killed a policewoman a day before launching his strike on the supermarket. Email “Profile: These are the four Jewish men killed in the Paris kosher supermarket attack”. Feedback on “Profile: These are the four Jewish men killed in the Paris kosher supermarket attack”.